A driver uses a phone while behind the wheel of a car on April 30, 2016, in New York City. If you're one of the many who text, read email or view Facebook on your phone while driving, be warned: Police in your community may soon have a tool for catching you red-handed. The new "textalyzer" technology is modeled after the Breathalyzer, and would determine if you had been using your phone illegally on the road. "Phone records — as I found out the hard way — they're tough to get [and] it's an agonizing process," says Ben Lieberman of New Castle, N.Y., whose 19-year-old son was killed in a car crash in the Hudson Valley, north of New York City, in 2011. The driver of the car his son Evan was in drifted over the center line and hit another vehicle head-on. Evan, who was sitting in the back seat with his seat belt on, suffered massive internal injuries and died a month later. The driver initially told police he dozed off while driving, but in reality he had been texting behind the wheel. It took Lieberman six months to figure that out. "Astonishingly, the phone was in the car, wrecked in the car, and it was at a tow yard," he says. "It was there for weeks — it was just sitting there." Lieberman says police couldn't check the driver's phone to see if he was lying because they needed probable cause to get a warrant. "We often hear, 'just get a warrant' or 'just get the phone records.' ... The implication is that the warrant is like filling out some minor form," he says. "It's not. In New York, it involves a D.A. and a judge. Imagine getting a D.A. and a judge involved in every breathalyzer that's administered, every sobriety test that's administered." Lieberman filed a civil lawsuit to subpoena the phone records, which showed the driver had been texting before the crash. But even getting the phone records won't tell you much, he says. "It doesn't detect any of the important distractions, like email, social media or Web browsing." "The takeaway is, our current law is a joke," he says. Lieberman — along with the advocacy group he co-founded — has been working with a company called Cellebrite to develop a "textalyzer." It would be able to determine whether a driver illegally was using a phone in the moments before a crash. Cellebrite engineer Lee Papathanasiou demonstrated the device for lawmakers and reporters at the New York State Capitol in Albany earlier this week. He says a police officer just goes to the driver and attaches a cord to connect the device to the phone. The driver doesn't even have to let go of the device. "They can simply just tap one button ... and it will process, about 90 seconds or so, and it will show what the last activities were — again that could be a text message and so on — with a time stamp," Papathanasiou says. The device would display a summary of what apps on the phone were open and in use, he says, as well as screen taps and swipes. "For example, if it was a WhatsApp message, or a call, it will indicate what the source was, the time stamp, and then what the direction of the communication was — so if it was an outgoing call versus an incoming call." Papathanasiou says the technology still isn't fully developed, but would be tailored to what's legal in each jurisdiction that approves its use. And he insists that the textalyzer would only capture taps and swipes to determine if a driver was using the phone — that it would not download content — and that it would be able to tell if the driver was using a phone legally, hands-free. But some privacy advocates and civil libertarians are wary. 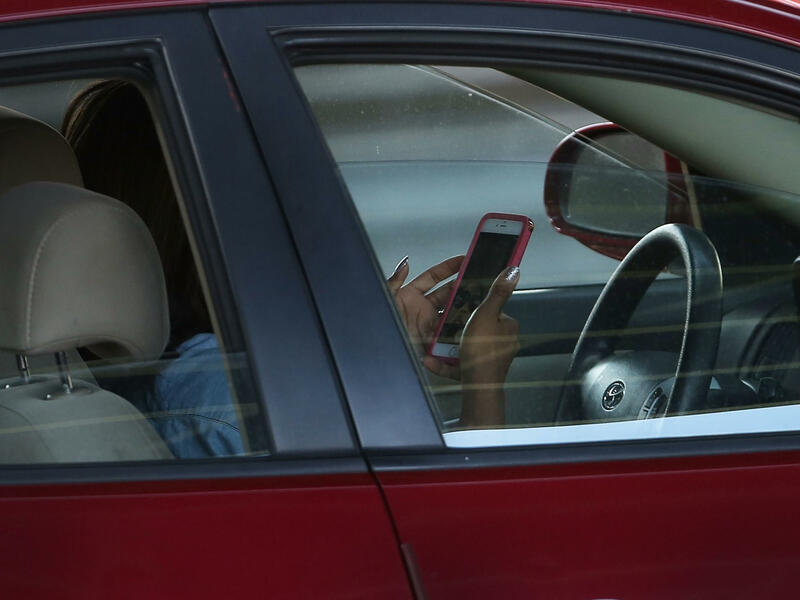 "Distracted driving is a serious concern, but this bill gives police power to take and search our phones after almost every fender-bender," says Rashida Richardson, legislative counsel for the New York Civil Liberties Union. "This is a concern because our phones have some of our most personal and private information — so we're certain that if this law is enforced as it is proposed, it will not only violate people's privacy rights, but also civil liberties." Traffic fatalities nationwide are on the rise, with close to 40,000 across the country last year, an increase of 6 percent. With a significant number of those fatalities attributed in part to distractions from phones, safety advocates — including Debbie Hersman, who heads the National Safety Council — say this could be big. "The textalyzer is going to be a game-changer when it comes to handheld devices and potentially even in-vehicle systems," Hersman says. "It will be the Breathalyzer of our electronics." In New York, the bill authorizing police to use the textalyzer has passed out of one committee and is pending in another. Lawmakers are interested in the device in New Jersey and Tennessee, and in Chicago and other cities, too, as they consider ways to get drivers to focus on the road instead of their phones. Texting and driving - you know it's bad. Here's another reason to stop doing it - a device like a breathalyzer that can figure out if you've been using your phone behind the wheel. Lawmakers in New York are thinking about allowing police to use this thing to crack into your phone. NPR's David Schaper explains. DAVID SCHAPER, BYLINE: Six years ago, Ben Lieberman's 19-year-old son Evan was killed in a car crash in the Hudson Valley north of New York City. The driver had been texting while driving, but it took Lieberman months to figure that out. BEN LIEBERMAN: And astonishingly, the phone was in the car, wrecked in the, car and it was at a tow yard. And it was there for weeks just sitting there. SCHAPER: The driver had said he had dozed off behind the wheel, and police couldn't check the phone to see if he was lying. Why couldn't they just get a warrant? LIEBERMAN: The word just is interesting. The implication is that the warrant is like filling out some minor form. It's not. In New York, it involves a DA and a judge. Imagine getting a DA and a judge involved in every breathalyzer that's administered, every sobriety test that's administered. LIEBERMAN: The takeaway is our current law is a joke. OK? SCHAPER: Lieberman has been working with a company called Cellebrite to develop a device called the textalyzer. It would be able to determine whether a driver was using their phone illegally in the moments before a crash. SCHAPER: Cellebrite engineer Lee Papathanasiou demonstrated the device in Albany earlier this week. He says the driver never even has to let go of his or her phone. An officer just attaches a cord. PAPATHANASIOU: And they can simply just tap one button, a connected device here, and it'll process about 90 seconds or so. And it'll show you what the last activities were. Again, that could be a text message and so on with a time stamp. SCHAPER: Papathanasiou says the device is still being developed, but would be tailored to what's legal in each jurisdiction approving its use. And he insists the textalyzer would only capture taps and swipes to determine if a driver was using their phone. It would not download content, but would be able to tell if the driver was legally using their phone hands-free. But some privacy advocates and civil libertarians are wary. RASHIDA RICHARDSON: This bill gives police power to take and search our phones at almost every fender-bender. LIEBERMAN: Rashida Richardson is with the New York Civil Liberties Union. RICHARDSON: Our phones have some of our most personal and private information, so we're certain that if this law is enforced as is proposed it will not only violate people's privacy rights but also civil liberties. SCHAPER: But amid a rising number of traffic fatalities close to 40,000 nationwide last year attributed in part to distractions from phones, safety advocates like Debbie Hersman who heads the National Safety Council say this could be big. DEBBIE HERSMAN: The textalyzer is going to be a game-changer when it comes to handheld devices and potentially even in-vehicle systems. It will be the breathalyzer of our electronics. SCHAPER: In New York, the bill authorizing police to use the textalyzer is passed out of one committee and is pending in another. Lawmakers are interested in New Jersey, Tennessee and in cities like Chicago, too, as they consider making the textalyzer one more tool to try to get drivers distracted by their phones to focus on the road. David Schaper, NPR News. Transcript provided by NPR, Copyright NPR.